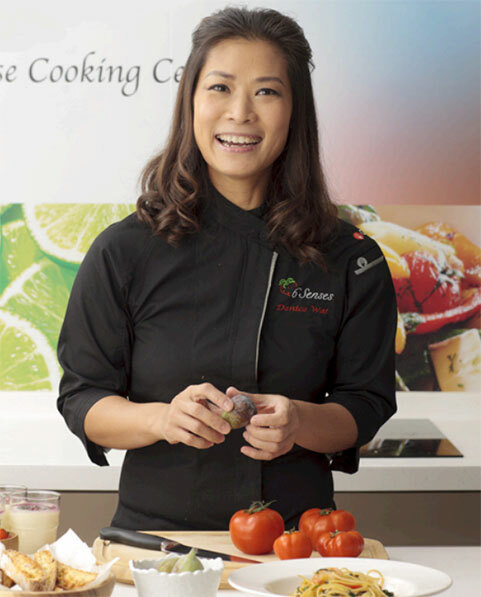 Denice Wai, hailing from Vancouver, chief instructor and also founder of Six Senses Limited, established 6 Senses Cooking Studio since 2004. Initially, Denice targeted her services to the local families. Since then her services have evolved and expanded to include corporations, schools and other groups with special needs. 6 Senses Cooking Studio’s main goal is to promote healthy life style and share her personal food experience to local communities. Denice cultivated her passion for cooking since she was a little girl helping her Dad, a professional chef operating a successful catering business in Hong Kong. Her love for food and cooking has led her to travel extensively to Europe, South East Asia and North America to experience the culinary delights that each country offers. She then integrates the best from the West and the East into her own unique cooking style. Because of her family health history, who are suffering from heart disease, diabetics, food allergy, high blood pressure, asthma and cancers. Denice has spent years in researching and self-studying in food nutrients and ingredients substitution in cooking. In 2006, Denice has created Gluten Free baked products and also provide cooking classes to those who are suffered from serious food allergy or require special diet arrangements. Since 2007, Denice has further expanded her cooking experience to local TV stations, currently she is the co-host of TVB Jade “Chef Minor 1 & 2 – 我係小廚神1 & 2) and host of “新派煮意 – Denice’s Kitchen” – TVB Network Vision Channel; “Gorilla Club Kitchen Cooking Program – 猩猩廚房” TVB Network Vision Channel 11 and 811 and also co-host of “Hey Big Spender – 鬆容大花筒” Metro Finance Radio Weekly Talk-Show. In Vancouver, B.C. Canada, Denice is the TV host of Fairchild TV “名人愛廚房” and also a guest chef for AM1470 Deborah Moore Radio Talkshow and Fairchild TV – Sizzling Sumer TV Food Program. Furthermore, Denice also appears as a guest chef for TVB Jade “Madam Wong Cooking – 吾淑吾食”; “都市閒情” 及”上門教煮餸” & ATV – “生話加油站” TV Cooking Programs, Apple Daily On-Line Cooking Show, I-Cable TV - Food Channel. She also act as a food column writer and recipe creator for Lisa Magazine, Apple Daily Newspaper, Parent Magazine, Pregnancy Magazine, Baby Magazine, Ming Pao Weekly, Sing Dao Newspaper, Oriental Daily, Sudden Weekly Magazine and few others Chinese and English Newspapers. In 2013, Denice has further expands her skills in creating her brand name “Denice Wai 韋兆 嫻” Food Products which are widely sell in well-known supermarkets such as Three-Sixty, Sogo, Jason, Market Place, YATA, Aeon and other varies food stores and health stores. Before opening 6 Senses, Denice has freelanced as an instructor at Towngas Cooking Centre during her stay in Hong Kong. When she lived in Vancouver, she opened “Denice Dessert House” that specialized in gourmet desserts, wedding cakes and gift basket design for customers.